Building or improving a commercial structure can come with a unique set of challenges for contractors and property managers alike. When it comes to drywall installation, for example, you need a team of experts who can work with you to create an accurate, cost-effective outcome for your project. Illinois businesses that require the help of a local commercial drywall company can benefit from speaking with AZ Drywall Finishing. For years, our drywall contractors in Chicago have worked diligently to create beautiful results for all of our clients. By focusing on our skills and investing in the best training techniques, our drywall company is able to provide efficient services that are as beautiful as they are affordable. Our drywall finishers are here to create amazing outcomes for your building. We’re passionate about our services, and we’re dedicated to meeting your high expectations. Proposals. Budgeting for a project relies on the input from your contractors, from the earthwork below to the skylights above. Receiving a quote that does not accurately reflect the price or scope of the work can create logistical issues down the road. Our drywall experts will work hard to deliver an accurate quote that is timely and adaptable. Scheduling. Installing drywall in a commercial application means that your daily business operations may be impacted during renovations. Our drywall contractors strive to arrive on time so that you can keep your timetable on track for success. We value your time and we will work as safely and as quickly as we can to get your operations back to normal. Installing. Your chosen drywall company may sound good on paper, but their staff may not be as respectful or as courteous as you’d like. The AZ Drywall Finishing team focuses on the needs and concerns of our clients, and each individual will take the time to speak with you for a prompt correction to any issues you find. Our proven practices help to minimize any disruptions to your operation. Cleanliness. Our team also sets a high standard for worksite cleanliness. Our work area will always be clean and tidy to minimize any safety issues, and the standard we work for ensures that your business is always free of dust and harmful particulates. Our dustless electric sander, for example, collects all dust that is generated in order to keep the area clean and clear. Quality outcomes. Our drywall finishers work hard to create the best possible outcome for your project. All of our results are built to last, and if you find any issues with our craftsmanship, we’ll be back to fix it right away. Customer satisfaction. AZ Drywall Finishing relies on reputation as the best form of marketing. We work hard to deliver the highest level of customer service to keep our clients happy and returning for more work. 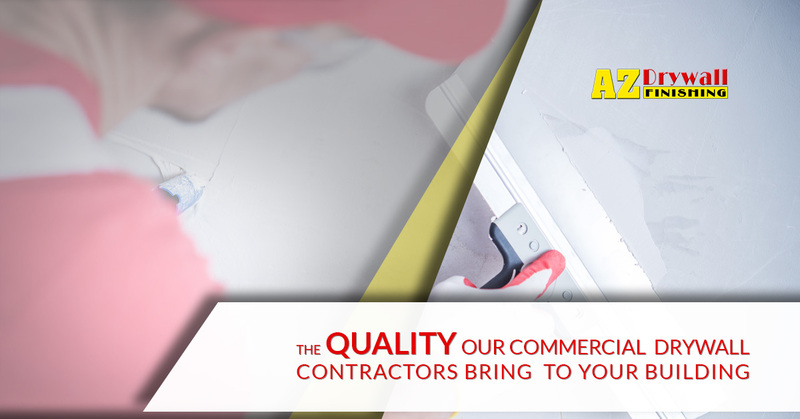 Our drywall contractors will be there when you need them, providing the best services in the industry. Finding a commercial drywall company that can meet the demands of your project just got a lot easier. AZ Drywall Finishing is proud to provide quality services to Illinois projects. Since 1999, our Chicago drywall contractors have worked to perfect our processes to create optimal outcomes for each and every client. Contact us today to learn more about our drywall services!